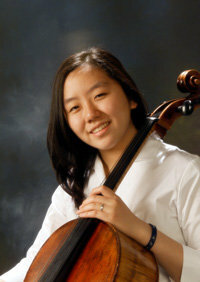 Hyunjin Jessica Cho, 17, a senior at Glenbrook South High School, started playing the cello at the age of eleven with David Cunliffe at the Music Institute of Chicago. She has played the violin for four years with Betty Haag, and was involved with the Magical Strings of Youth where she traveled to Australia, Taiwan, Korea, Singapore, China and all over the US. She journeyed to Beijing as one of the guests of the Chinese government and the Motorola Corp. She is currently a member of the MIC Academy Program. She is a member of the Glenbrook Symphony Orchestra, where she is the principal cellist, and American Chambers Strings. With the American Chamber Strings, she traveled to Italy in the spring of 2006. She has performed with the En Gedi Ensemble twice as a soloist. Jessica has had masterclasses with renowned musicians such as Julliard violinist Tai Murray, Avalon String Quartet, the Pacifica Quartet, Soo Bae, teacher Richard Aaron, Amit Peled and much more. Recently Jessica has been asked to perform in front of violinist Midori at the MIC’s 75th anniversary. In the spring of 2006, Jessica also performed in the Young Steinway Concert Series. Her awards include first places in the Junior and Senior divisions at the Confucius Chinese Fine Arts Competition, concerto winner at the Glenbrook Concerto Competition 2005 and 2007, and her most recent: first place in the 2006 SAM Senior Division, first place in the 2006 Music Chorale Competition, Most Outstanding Player in the Senior Division 2006 Music at Trinity Competition, third place in the Sejong Music Competition 2007 and second place in 2008.